Professor Phillip A. Sharp was awarded the 1993 Nobel Prize in Medicine and Physiology Monday for his 1977 discovery of "split genes." The award will be shared with Dr. Richard J. Roberts of the New England Biolabs, who made the same discovery independently. The $825,000 award was announced by the Swedish Academy of Sciences in Stockholm, Sweden. Sharp, 49, who is also head of the biology department, is the twenty-fifth Nobel laureate affiliated with MIT. "The discovery of split genes has been of fundamental importance for today's basic research in biology, as well as for more medically oriented research concerning the development of cancer and other diseases," the Nobel Committee said in its formal announcement. "The discovery has changed our view on how genes in higher organisms develop during evolution. The discovery also led to the prediction of new genetic processes" known as gene splicing, the committee said. "When I got the telephone call from the Swedish Academy Monday morning I could hardly believe the news. I was surprisingly thrilled," Sharp said. "I told my wife and daughter the news right away. Then I noticed that reporters were already gathering outside of my house," he added. Sharp plans to take his wife Ann, three daughters, and parents to Stockholm where he and Roberts will formally receive the prize on December 10, the anniversary of the death of Alfred Nobel. The Nobel Prizes were established under the terms of Nobel, who was best known for the invention of dynamite. The prizes are awarded annually in the areas of chemistry, economics, literature, peace, physics, and physiology or medicine. Sharp discovered that genes of higher organisms are separated by "nonsense" DNA. This discovery of "split genes" has helped scientists understand why cells of higher organisms have so much excess DNA. The protein-coding regions, exons, are interrupted by the long segments of DNA that have no apparent protein message, introns. Because many segments of DNA are subjected to a surprising degree of movement, exons can move freely among intron segments. This creates an almost infinite variety of new gene sequences, which plays a vital role in the evolution of organisms. Sharp subsequently discovered that after DNA is copied into RNA, the cell's splicing machinery then clips out the unneeded introns and splices together the remaining exons. This resulting RNA molecule is the final transcript of the gene's protein-building instructions. Sharp earned bachelors degrees in chemistry and mathematics from Union College, Kentucky, in 1966, and a PhD degree in physical chemistry from the University of Illinois, Champaign-Urbana in 1969. From 1969-71, he was a postdoctoral fellow at the California Institute of Technology. From 1971-72 he worked at the Cold Spring Harbor Laboratory with 1962 Nobel laureate James D. Watson, and was a senior research investigator at Cold Spring from 1972-74. Sharp joined the MIT faculty in 1974 as an associate professor of biology and a member of the Center for Cancer Research. He received tenure in 1979, became associate director of the Center for Cancer Research in 1982, and served as its director from 1985 until July, 1991, when he was appointed to head the Department of Biology. Sharp became the first Salvador E. Luria Professor, a chair established by MIT in honor of the late Nobel laureate Luria, an MIT biology professor who started the Center for Cancer Research in 1972 and became its first director. 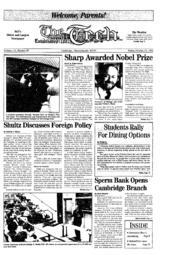 From 1988-92, Sharp held the John D. MacArthur Professorship, which was established in recognition of MIT's outstanding reputation and contributions as an institution of distinction in both instruction and research. His recent public service includes serving as co-chair of the National Institute of Health Strategic Plan; member of the Advisory Panel of the Joint High Level Committee on U.S.-Japan Science and Technology Agreement; member of the Committee on Science, Engineering and Public Policy; consultant to the NI* on Genome Patenting; member of the NI* Search Committee for Director of the National Center for Human Genome Research; member of the Howard Hughes Medical Institute Medical Board; and member of the President's Advisory Council on Science and Technology. Sharp has received over $20 million in research funding over the course of his career. Some of the companies and foundations that have supported Sharp's research include Bristol-Meyers; Merck, Sharpe, and Dohme; the John D. and Catherine T. MacArthur Foundation; and Ajinomoto, a Japanese pharmaceutical company. Sharp has published more than 240 articles in scientific journals and books. He is also a co-founder and member of the board of directors of Biogen Inc., a Swiss-based genetic engineering company which is now located in Cambridge. Among Sharp's awards are the 1990 Dickson Prize of the University of Pittsburgh; the 1988 Albert Lasker Basic Medical Research Award; the 1988 Louisa Gross Horwitz Prize of Columbia University; the 1986 Alfred P. Sloan Prize of the General Motors Cancer Research Foundation; the 1986 New York Academy of Sciences Award in Biological and Medical Sciences; the 1986 Gairdner Foundation International Award; the 1985 Howard Ricketts Award of the University of Chicago; the 1980 Eli Lilly Award in Biological Chemistry; and the 1980 National Academy of Sciences-U.S. Steel Foundation Award in Molecular Biology.